This article is about Pikachu's appearance in Super Smash Bros. Melee. For this Pokémon in other contexts, see Pikachu. For information about Pikachu's clone, see Pichu (SSBM). 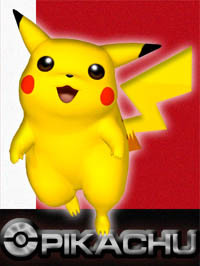 Announced at E3 2001, Pikachu (ピカチュウ, Pikachu) is a Pokémon and starter character in Super Smash Bros. Melee. Like Kirby and Ness, Pikachu was nerfed from the original to Melee, albeit not as strongly. Pikachu ranks 9th on the current tier list, in the C tier. This is a vast drop from its previous ranking in Smash 64 where it was ranked 1st and is its lowest placement in the series. Pikachu, while nerfed from the original SSB, is still a potent fighter; it has very good speed and plenty of KO options, as it owns the strongest up smash in the game and a quick semi-spike in its up-air. It also has a very long, safe, and versatile recovery. However, Pikachu is held back by very short range, with its best finishers having hitboxes very close to its body; coupled with sub-par options in the air and a short wavedash, Pikachu overall has a lackluster neutral game and approach. In general character archetypes, Pikachu generally stands as a small fighter with good speed; Pikachu has medium falling speed, very good dashing speed (fourth highest in the game), high traction and below average air speed. Its average falling speed and high traction gives it a short wavedash; average falling speed, however, also gives Pikachu decent SHFFL potential. Due to its small size, Pikachu is also rather resistant to shield stabbing. Pikachu's main strength is its fantastic edge game. Its up and down aerials are quick and can easily gimp recovering opponents, as the former acts as a semi-spike when sweetspotted and the latter has decent horizontal knockback, and its forward and down tilts can intercept recovery attempts close to the ledge. Additionally, Pikachu's back throw can easily send opponents off the edge, allowing it to easily set up edgeguards, even at lower percentages. Pikachu, on the other hand, is very resilient to edgeguarding; Skull Bash can give it significant horizontal distance, and Quick Attack moves very quickly, grants good distance, and has very unpredictable paths. Most characters do not have options to cover all of these recovery methods at once, and must thus rely on hard reads, rather than reactions, to properly edgeguard Pikachu. Pikachu's other strength is its solid punish game; although Pikachu is fast and light, it still possesses several ways to combo and KO opponents. Pikachu's jab is quick and weak, giving it some of the most consistent jab reset followups in the game. Its forward, neutral, and up aerials are quick and can be used for aerial strings or juggling. Pikachu's forward and up smashes are among the most powerful in the game; its up smash, in fact, is the most powerful of its kind at realistic KO percentages, and can be used as a powerful tech chasing tool at all percentages, threatening further up smashes on fastfallers at lower percentages and KOs at medium to high percentages. Pikachu's grab game helps facilitate its punishes; its up and down throws can be used to set up combos, and the former can chaingrab fastfallers and even set up for its powerful up smash at KO percentages. Pikachu also has a very good variety of special attacks, all of which can be seamlessly integrated into gameplay. Its Thunder Jolt is among the most flexible projectiles in the game, due to its ground-hugging properties; with low knockback and decent hitstun as well, it can set up combos on the ground, and can also interrupt some recoveries. Skull Bash, as aforementioned, acts as a horizontal recovery extender, and can double as a situational offensive attack with high power when charged. 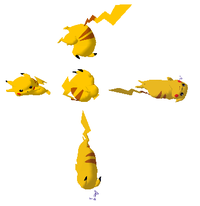 While Quick Attack has little offensive application, the ability to change its directions and its speed gives Pikachu a long and unpredictable recovery. Thunder, despite its high ending lag, can act as a combo finisher or as a KO move off-stage. Pikachu's primary flaw, however, is its poor range. Almost all of its best finishers are very close to its body, making it difficult for Pikachu to secure KOs at times, and forcing Pikachu to constantly approach to keep pressure on the opponent. Additionally, Pikachu's relatively flexible grab and throw game is severely hampered by a very short grab range (the shortest in the game). However, Pikachu's approaches are mediocre as well, compounding this difficulty in pressuring the opponent. Pikachu is very mobile, and its dash dance is good, but it has a short wavedash and lacks safe grounded moves to use out of it. Its only good approaching options on the ground are down tilt, and the disruptive but highly punishable down smash. This forces it to frequently take to the air and perform either telegraphed Thunder Jolts or neutral aerial crossups on the opponent to gain an advantage, but such tactics are very committal, due to those moves' moderately high ending lags, and Pikachu's average falling speed and rather high short hop. All of these attributes make Pikachu's approaches very linear and predictable, and thus saddles it with a lackluster neutral game, allowing characters with stronger neutral game tools to easily gain openings on Pikachu while it struggles to get openings itself. Additionally, due to its light weight and below average air speed, Pikachu is very easy to juggle, chaingrab, and combo. Pikachu's hardest top tier matchup, Sheik, can chaingrab it from 0% to 50% in the NTSC version, perhaps higher if the Pikachu player has poor DI. Pikachu is also susceptible to several potentially lethal grab setups, such as Fox's notorious up throw to up aerial, Marth's forward/down throw to forward smash, and Captain Falcon's down throw followups. Overall, Pikachu is a rather challenging character to succeed with, especially against top-tiered characters. While Pikachu has stellar edgeguarding and recovering abilities, and can harshly punish the opponent once it gets its hands on them, it suffers from poor range and a predictable neutral game. Pikachu players should look to make the most out of the few neutral options they have, and constantly seek mix-ups through conditioning opponents; additionally, they should seek counterplay, and try to bait opponents into going off the ledge, where Pikachu is most comfortable. Given that Pikachu was considered to be the best character in SSB, it was considerably nerfed in the transition to Melee, much like Ness and Kirby were. Unlike the two, however, Pikachu still remains a viable competitive fighting force. Pikachu's overwhelming advantages from the previous game, such as its consistent combos, powerful finishers, and useful specials, were toned down. However, its grabs have gained more utility and some of its attacks have gained power or unorthodox properties that aid them in edgeguarding, helping Pikachu keep its ground at the top of the mid tier next to Samus. Pikachu received new voice samples that are higher pitched, sound less aggressive and more energetic. Pikachu's taunt was also altered slightly. It no longer taunts facing away from the screen if Pikachu taunts to the right. Pikachu is heavier (72.414 → 80), which improves its endurance, but makes it easier to combo. However, this is compensated for its slightly slower falling speed. Pikachu is slightly floatier (52 → 1.9). Pikachu dashes faster (55 → 1.8). Pikachu is more vulnerable to combos and chaingrabs. Air speed is significantly slower (37.5 → 0.85) , going from the second fastest in Smash 64 to below average in Melee. Pikachu walks slower (0.42 → 1.24). Pikachu's short hop is lower. Forward roll has less ending lag (frame 36 → 32). Neutral attack has less ending lag (frame 34 → 22) and can now be reset. Neutral attack has a shorter duration (frames 2-5 → 2-3). Additionally, Pikachu can no longer cancel neutral attack into grab. Forward tilt (11%/10%/9% → 9%/8%/7%), up tilt (11% → 7%/6%) and down tilt (12% → 7%) deal less damage without full compensation on their knockback. Up tilt has less ending lag (frame 26 → 24). Up tilt has more startup lag and a shorter duration (frames 5-14 → 7-14). It is harder to combo from due to its increased knockback (10 (base), 100 (scaling) → 40/124), altered angle (87° → 96°/88°) decreased hitstun and cannot chain into itself nearly as reliably. Its hitbox is also slightly less disjointed, hindering its range. Down tilt has less ending lag (frame 26 → 19). Down tilt has more startup lag and a shorter duration (frames 6-13 → 7-9). It is overall a less effective edgeguarding tool due to its lower damage. Dash attack has less ending lag (frame 58 → 50). Dash attack has a shorter duration (frames 5-19 → 5-16) and deals less damage (12% → 8%). Up Smash's clean hit no longer does consistent damage (18% → 19%/18%/17%). Forward smash also does not deal consistent damage throughout the whole move (18% → 21%/19%/18%). Forward smash has less startup (frame 21 → 16) and ending lag (frame 62 → 50). Forward smash has a much shorter duration (frames 21-42 → 16-23) and deals less knockback (20 (base), 100 (scaling) → 25/92 (clean), 25/(95/90) (mid), 25/(95/90/85) (late)) hindering the late hit's KO potential. Up smash has less startup lag with a longer duration (frames 10-18 → 8-17) and has more knockback scaling (100 → 110) on most of its hitboxes. Up smash's sourspot is weaker (9% → 7%) dealing less knockback (10 (base), 100 (scaling) → 5/48) and its clean hit is now harder to land with the clean hit's sourspot being weaker than the previous up smash. It also has slightly higher ending lag (frame 40 → 41). Pikachu has a new down smash. It is a multi hit move that has more combo potential due to it having lower knockback and sending foes at a more vertical angle (361° → 70°). Down smash has less startup (frame 10 → 7) and ending lag (frame 55 → 51). Down smash is much less reliable due to being a multi hit as opponents can now SDI out of it. It also deals less damage (16% (front), 13% (back) → 13%) and has much less KO potential as the knockback on the final hit wasn't compensated enough (30 (base), 120 (scaling) → 70/170). All aerials auto-cancel later (frame 28 → 35 (neutral), frame 26 → 34 (forward), frame 21 → 50 (back), frame 1 → 18 (up), frame 26 → 39 (down)). When combined with its lower short hop, this prevents Pikachu from auto-cancelling its aerials in a short hop except for up aerial which is made worse with the weakening of L-canceling. Pikachu has a new neutral aerial: a somersault. Neutral aerial deals less damage (14% (clean), 11% (late) → 12%/9%) without full compensation on the clean hits base knockback (15 → 18) hindering its KO potential and has more ending lag (frame 37 → 40). It also has a smaller hitbox. Neutral aerial has more combo potential. Forward aerial deals much less damage (21% → 7%), has more startup lag (frame 7 → 10), has less combo potential and no longer has a landing hitbox. Pikachu has a new back aerial: a sideways spin. New back aerial has less startup lag and a longer duration (frames 10-21 → 4-37). New back aerial has heavily increased ending (frame 42 → 60) and landing lag, has less range, and deals less damage (16% (clean)/14% (late) → 12%/9%) without enough compensation on its base knockback (15 → 20). Up aerial has much higher base knockback (10 → 100) and can now semi-spike, granting it edgeguarding potential at the cost of some of its juggling potential. Up aerial has less ending lag (frame 34 → 28). Up aerial has a shorter duration (frames 3-10 → 3-8) and deals much less damage (10% → 4%) and has less knockback scaling (100 → 60). It also no longer auto-cancels throughout its entire duration giving it much more landing lag (4 frames → 26). Down aerial has less combo ability, more startup lag, a shorter duration (frames 8-25 → 14-26) and more ending lag (frame 45 → 48). It also deals less damage (13% → 12%). Down aerial now has a landing hitbox. Pikachu has been given a pummel, an up throw and a down throw, significantly improving its grab game by giving it more moves that will potentially lead into combos. Grab range has been reduced, now being the shortest in Melee. Additionally, Pikachu's grabs have more startup lag (frame 6 → 7 (standing), 11 (dash)) and ending lag (frame 16 → 31 (standing), 41 (dash)). Pikachu's old back throw was moved to forward throw. Forward deals less damage (12% → 2% (hits 1-4), 2% (throw), 9% (total)) and significantly lower knockback (80 (base), 70 (scaling) → 45/110) no longer being a viable kill option. Pikachu's new back throw involves Pikachu rolling backwards allowing it to move closer to the edge to set up edgeguards. Back throw deals significantly less damage (18% → 9%) and knockback (60 (base), 80 (scaling) → 75/50) no longer being a viable KO option. All throws now have electrical properties. Thunder Jolt has less startup (frame 21 → 18) and ending lag (frame 64 → 58) and the Thunder Jolt will continue to hug and traverse platforms once it passes the edge of the platform. Pikachu now has a side special move: Skull Bash. This move functions similarly to Luigi's Green Missile, meaning that it is a decent recovery option that boasts good KO ability. Quick Attack now has hitboxes and has less startup lag. Quick Attack travels slightly less distance, can no longer be extended by allowing the control stick to snap back to its neutral position, and has had most of its invincibility frames removed. This means it is much less useful for escaping combos, recovering and maneuvering across platforms. Thunder has less startup lag. Thunder's blast also deals more damage (16% → 17%). Thunder has a new glitch called the ceiling glitch. This glitch improves Thunder's edgeguarding potential. Thunder no longer has infinite vertical range and now strikes at a fixed height from a thundercloud. The thunder bolt also deals less damage (12% → 10%) and Thunder has much more ending lag, which when combined with the generally faster falling speeds in Melee, makes Thunderspiking more difficult to perform and generally much less effective. For a gallery of Pikachu's hitboxes, see here. 2% An extremely quick headbutt. Does very minimal damage, and has short range. This attack can be canceled into itself with two frames between possible inputs, so it can be mashed for a quick series of headbutts. 9% Plants itself on its upper paws and kicks its lower paws in front of its body. This move has surprising range, and the hitbox is out for nearly the whole duration of its animation. Can be used as a defensive attack, or for an edgeguard. It is best used as a counter to SHFFLing characters, as it will almost always interrupt their approach. Low damage, low knockback. This attack can be angled up and down. 7% (tail), 6% (tip) Swings its tail above its body in an arc. This attack is hard to set up, as it has low range. The knockback works well for juggling and combos well however, as it sends opponents upward. Low damage, low knockback. 7% Sweeps its tail in front of itself. This move has decent range, low knockback, and low damage. However, it doesn't have a lot of lag and hits rather low. This can be used as an edgeguard against characters with a linear and/or predictable recovery, though there are better options. 8% Jumps forwards, headbutting. While it does have some knockback, it is rather laggy and leaves Pikachu vulnerable (it is particularly easy to shield grab). 21% (early), 19% (clean), 18% (late) Rears back, then ejects an attached jolt of electricity in front from its cheeks. A powerful attack that can evade some attacks with the initial animation. Has decent range. The hitbox is disjointed, which makes it a wise choice for edgeguarding. This attack has transcendent priority. 17%-19% (clean), 13% (mid), 7% (late) Does a quick backflip, attacking with its tail. This is the strongest up smash in the game in terms of knockback, is extremely quick with decent range, and is one of the strongest smash attacks. Pikachu's up smash is extremely versatile, whether it be setting up juggles or going for a quick low percent KO. Is also good for shield stabbing. Capable of KOing at 35%-55% when fully charged. 2% (hits 1-6), 3% (hit 7) (≈13.83% total) Spins around in place repeatedly, while surrounded with electricity. This is a multi-hit attack that comes out very quickly. Easily used from a successful crouch cancel, and sets up for an aerial at lower percentages. This attack has transcendent priority. 12% (clean), 9% (late) Curls up in a ball and does somersaults in the air. This is a versatile aerial, as it does decent damage, decent knockback, and comes out very quickly. A generic use-anywhere aerial. 2% (hits 1-4) (≈7.46% total) Does a barrel roll in the air, emitting sparks. Hits multiple times with minimal damage. This has more horizontal range than any of Pikachu's aerials. The move, however, has little knockback. 12% (clean), 9% (late), 4% (landing) Spins in the air in a manner similar to its down smash, but without electrical effects. Decent range, damage and knockback, however it lags noticeably if missed, especially if Pikachu lands. 4% Swiftly swings its tail above itself in an arc. Extremely quick with low knockback, this can be used to juggle opponents repeatedly. Also, if hit with the tip of the tail at certain points during the arc, this will send opponents far at a nasty semi-spike angle similar to Sheik's forward aerial. This trajectory can be achieved even at low percentages. This attack makes edgeguarding a breeze against predictable, linear, and/or slow recoveries. An essential attack for controlling the match. 12%, 4% (landing) Does a barrel roll, like its forward aerial, except it is facing the ground. Unlike the fair, this does one hit in the air, and an extra hit upon landing if the animation is still going when Pikachu lands. The aerial hit does decent damage and has good knockback, more so than the neutral aerial. The hit upon landing has far lower knockback and stun. This attack lags significantly more than the neutral aerial however, and has noticeable startup lag. 2% (hits 1-4), 2% (throw) Places the opponent on its back and shocks them, sending them forward. This throw is multi-hit, and has low knockback. The only use for this throw is to build damage if no other throw setups are available, which is a rare situation. 9% Does backwards somersaults with the opponent, then flings them behind itself. Has decent knockback, and is best used near an edge so as to get maximum range from the throw. 5% (hit 1), 5% (throw) Places the opponent on its head, then headbutts them upward. This throw can chaingrab fastfallers, and at high percentages it is a useful combo move, as it can easily lead into an up smash or up aerial. 5% (hit 1), 5% (throw) Places the opponent on the ground, then jumps on them. This is a good move against lightweights (like Jigglypuff) at low percentages, as it can lead into a up smash for a low percent KO. This throw is more easily DIed than the up throw. 8% Quickly does a cartwheel and attacks with its foot. 6% Slowly climbs up and whips its tail. Thunder Jolt 7% (ground), 10% (aerial) Pikachu's main projectile. Fires a jolt of electricity forward. It travels forward while bouncing along the ground, and can also travel up walls, below the edge, and along ceilings. If used in the air, it will travel diagonally down instead. Disappears after around 3 seconds. Can be used to gimp certain recoveries. Skull Bash 4-29% Charges and, when the B button is released, fires itself forward like a missile. When fully charged or close to fully charged, it has KO power. The move can also be used to extend Pikachu's recovery, though it does have some lag. On the ground, the attack has rather high lag and is easy to shield grab (similar to dash attack). Performing the move like a smash attack causes the move the finish charging sooner. Quick Attack 3% (first warp), 2% (second warp) Moves at warp speed in two directions that can be selected via the control stick. Pikachu's main recovery move, and a quick, unpredictable move at that. The second warp is optional, but if used, the direction must be 45 degrees different than the first direction to work. However, new developments suggest that it may be possible to move in the same direction twice - moving up twice can possibly be performed by tilting the Control Stick left, right, or down ever so slightly on frame 22 or 23. The move can be used to warp to the ledge to set up an edgehog, though if not done correctly, Pikachu will be left helpless. Thunder 10% (bolt), 17% (blast) Shouts "PIKA! ", then a large thunderbolt comes down on Pikachu. The move in general is rather laggy, but if the opponent is hit by the shockwave around Pikachu when the thunderbolt lands on it, it deals massive horizontal knockback. If the opponent is hit by the bolt itself, it deals moderate vertical knockback, which can KO off the top screen (referred to as Thunderspiking - can be set up with an up smash). It is also possible for the bolt to not hit Pikachu, by moving in the air after using the move. This attack has transcendent priority. The bolt can hit up to 4 times (Although it's unlikely), and touching Pikachu himself causes damage for the first half of the attack. Waves at the camera, yelling "Pika, Pika!" The taunt has IASA frames, as it can be interrupted by any attack when Pikachu starts the second wave. Note: According to the debug menu in Melee, Pikachu technically doesn't contain any idle poses. Instead, it will perform both its idle poses in one loop (mostly noticeable when Pikachu is currently holding an item). Both these animations become Pikachu's idle poses in Brawl and in Smash 4. Looks both sides while twitching its ears. Jumps up and somersaults, then spins around once before happily facing the camera, saying "Pika Pikaaaaaa!" Twitches its ears, then scratches its right ear. Lies sideways on the ground, sleeping. In the most recent revision of the character matchup chart, Pikachu has average matchups all around. It counters six characters, soft counters four, and has even matchups with five, but is in return soft countered by five characters, countered by four, and hard countered by one, Sheik. Pikachu was thought to only do well against characters who lacked the tools to overcome its speed and pressure, such as Bowser and Zelda. However, since it is a light character with a poor approach and a perceived poor range, many considered characters with superior mobility, range, or pressure options, such as Fox, Marth, Falco, and the Ice Climbers, advantageous in their matchup against Pikachu. Also, Mario can chain grab him with down throws, as can Sheik. Additionally, it was a widespread thought at the time that Sheik could chaingrab Pikachu until 90%- a disadvantage that was significant enough to consider her Pikachu's decisive hard counter. However, as Axe rose to dominance and Pikachu up the tier list, opinions on Pikachu's matchups began to change. Appropriate usages of Pikachu's powerful KOing and gimping options can capitalize on several of the top tier characters who were considered its counters. Additionally, with proper DI, Sheik cannot chaingrab Pikachu as easily as once thought. In return, despite its poor grab range, professional smashers discovered Pikachu's up throw chaingrab on fast fallers on Final Destination, which has greatly improved Pikachu players' counterpicking games. His matchup with Falcon is still considered even, while his matchups with Fox and Falco, though still losing ones, has gotten better due to his strong combo game, chain grabbing ability and excellent edge guarding. His matchup with Marth is no longer considered as bad as it once was as Marth's strongest tools, his grab game and edge guarding, don't work on Pikachu as much along with having trouble killing it at high percents. It is no longer considered to have losing matchups against Mario, Dr. Mario nor Luigi at the current moment due to advances in its escape options, combo potential and strong edge guarding. His matchups with Sheik, Peach, Jigglypuff and Ice Climbers are still considered difficult matchups for it. Pikachu's matchup spread is expected by many Melee players to greatly improve in the next iteration. Axe - Widely known as the best Pikachu player in the world, Axe is ranked 10th on the 2018 MPGR. Anther - Although better known for his Project M Pikachu, Anther has a formidable melee Pikachu and is currently regarded as the Best Midwest Pikachu. BonkCushy - Best New England Pikachu. Kimchi - Best Pikachu Player in Tennessee, ranked 7th on the Tennessee Power Rankings. KL3SHIKUH - Best Pikachu player in SoCal. OkayP. - Best Pikachu player in Utah, ranked 3rd on the Utah Power Rankings. Trix - Best Pikachu player in Chicago, Top 3 Pikachu in the United States. DJ Nintendo - Although he was more known for his Fox and Bowser, He also secondaried Pikachu. Philly Billy - Notably top Pikachu in Tri-State during the MLG era of Smash. Rori - Won MLG Seattle 2004 with Pikachu/Falco, best Pikachu in Northwest when he was active. Pikachu was originally a low-mid to low tier character; many professionals thought Pikachu's heavy power, speed, and combo ability nerf from Super Smash Bros. was unmanageable, and that it had lost all of its viability in the transition to Melee. Axe proved this thought wrong, however, as he showed how powerful Pikachu was at pressuring the enemy, especially at edgeguarding (due to Pikachu's notorious up aerial semi-spike). He also showed how powerful Pikachu was up close, despite its problems in approaching the enemy efficiently. Axe, and a handful of other dedicated Pikachu players such as PikaChad, eventually brought Pikachu up to the high-mid tiers, where it ranks now in 9th place. In Classic Mode, Pikachu can appear as an ordinary opponent, as an ally or opponent in team battles, alongside Pichu, Jigglypuff, or Kirby, or as a metal opponent. In Pikachu's appearances, it appears on Pokémon Stadium as a regular opponent, and on Battlefield as a metal opponent. And on team battles, it appears on Green Greens with Kirby. Pikachu appears in Stage 7 of the Adventure Mode. In its stage, the player must fight eight separate Pikachu's on Pokémon Stadium similar to the Classic Mode's team battle; if Jigglypuff and Pichu are unlocked, they can also appear in the team. In this stage, the only items to spawn are Poké Balls. Pikachu and its allies are fought on Pokémon Stadium. Event 7: Pokémon Battle: The player chooses any character and must defeat Pikachu in a two-stock match on Pokémon Stadium. The only way to damage and KO Pikachu is to use the Pokémon that appear from Poké Balls on the stage, as regular attacks will not harm it. Event 13: Yoshi's Egg: As Yoshi, the player must protect the Yoshi's Egg item from harm for 55 seconds against a team of Fox, Donkey Kong, and Pikachu on Rainbow Cruise. Event 30: All-Star Match 3: Pikachu is the second opponent fought in this series of staged battles. The player battles it on the Pokémon Stadium, which will transition to the next stage if Pikachu gets defeated. With a timer of four minutes, the player must defeat it along with Kirby, Ness and the Ice Climbers. Event 48: Pikachu and Pichu: The player chooses any character and fights against a team of two Pichus and one Pikachu on Dream Land. The player's main goal is to KO the two Pichus while avoiding Pikachu, who has infinite lives while the player has two and both Pichus have one. The event is played on Dream Land, making it the only Melee event match set on a Past Stage. Pikachu is the only character in the Original 12 from Smash 64 which does not have an assigned event match. Posing with Mewtwo on Final Destination. Posing with Pichu on Green Greens. Posing with Young Link and Kirby on Green Greens. Taunting with Ness and Kirby on Temple. Looking at the screen on Pokémon Stadium. Jumping towards a giant Yoshi on Fourside. This page was last edited on April 7, 2019, at 21:57.